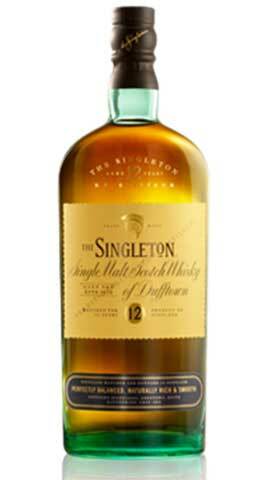 The Singleton of Dufftown was released to replace the Singleton of Auchroisk, but just to confuse you...the Singleton is actually 3 different single malts for 3 different markets...so, The Singleton of Glendullan for the USA, The Singleton of Glen Ord for Asia and The Singleton of Dufftown for Europe. So this bottle is the European release, which won the 'Best Speyside 12 years and under' at the World Whiskies Awards 2012. Matured in a combination of American and European oak casks. "Perfectly balanced, naturally rich and deliciously creamy"
A rich nose of wood, caramel, tart apple, sherry, and lightly spiced pear. The palate is powerful with savoury notes of wood, black pepper and spice. The finish is warm and dry with hints of banoffee, Bourbon oak and red berries. A complex and well-integrated whisky. A combination of old bourbon casks of American Oak and ex-sherry casks of European Oak. TAILFIRE has been created using specially selected casks to enhance particular elements of the flavour profile of this classic Speyside malt whisky. It has a vibrant and enticing character, which comes from maturation in a higher proportion of European Sherry oak casks specially selected to enhance the juicy red berry freshness and sweet aromas of vanilla and fresh cut grass. The name TAILFIRE is derived from the names of salmon flies, inspired by the world of the Singleton icon, the leaping salmon and fly fishing on the River Spey. 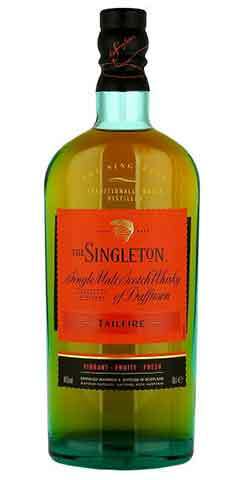 "A vibrant evocation of Dufftown’s fruity character with notes of fresh red berries and sweet vanilla aromas. Best enjoyed with a dash of water" "Sweet and minty, then agreeably smooth; elegant, rich and oaky with velvety chocolate and a creamy hint of coconut, leading to a faintly smoky, aromatic conclusion with orange oil, oak and cedar"